The weeding effort for the first five months of the 2013-14 weeding season has been summarised. The total effort for the season to date is slightly less than last year, although a greater amount of effort has been spent on the Reserve. The predominant weed types requiring attention in November were St. John's wort, miscellaneous Broadleaf weeds, Verbascum and Saffron thistles, while for the season to date they were Saffron thistles, St. John's wort and Paterson's curse. The weeding effort for the first four months of the 2013-14 weeding season has been summarised. The total effort for the season to date is the same as last year, although a greater amount of effort has been spent on the Reserve. The predominant weed types requiring attention in October were St. John's wort and Saffron thistles, while for the season to date they were St. John's wort, Saffron thistles and Paterson's curse, all of which are experiencing a favourable year for growth. Some new ways of viewing the effort data have been added this month, including a new comparison of the monthly effort this season with the last three seasons for each weed type, which allows a comparison of the effort requirement this year with the past as well as allowing an expectation of how effort is likely to be needed in the coming months. The weeding effort for the first three months of the 2013-14 weeding season has been summarised. While overall less effort has been spent (and required) than the previous two years, there has been the same amount of effort spent on the Reserve as last year. The predominant weed requiring attention has been Paterson's curse, followed by Saffron thistles and Slender winged thistles, all of which are experiencing a favourable year for growth. See the weeding effort page and associated links to maps and graphs for more details. A program of 4 diverse guided walks have been organised for October and November to welcome in Spring on the Pinnacle. Thank you to all the fotpin members who gave their time and effort to controlling weeds on the Pinnacle Nature Reserve in the season past; there are definite signs that we are making progress, which the analysis of the weeding effort data collected allows us to explore. Effort for the 2012-2013 weeding year was less (by 139 hours, or 10%) than in 2011-2012. 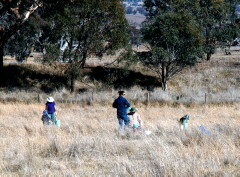 However, much more effort was spent controlling weeds in the neighbouring paddocks (315 hours, or 170%). Despite the fact that this means that 454 hours (38%) less effort was spent on the Reserve, the weeding teams believe that an effective level of weed control on the Reserve was achieved. 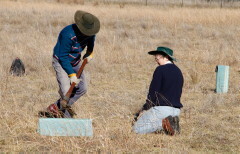 Expanding weed control to the neighbouring paddocks helps with weed control in the Reserve by creating a buffer against re-infestation by weed seeds carried by wind or animals. The weed control effort can be viewed as a measure of the level of weed infestation, so its analysis provides a means of comparing the intensity of weed infestations from season to season, from paddock to paddock, and species to species. The decrease in the amount of effort required to control weeds to an acceptable level on the Reserve is ascribed to a number of factors: the much drier conditions and less intense weed infestations than in the previous year; more efficient weed control methods; and carry-over effects of weed control in the previous year. These different ways of viewing the effort data all contribute to analysing the progress of our weed control and helping to plan our control in future years for maximum effect. Congratulations to John Fitz Gerald who received the "Quiet Achiever Award" at the annual ACT Landcare awards on Thursday for his work work on grasslands and woodlands. The award was shared with Ken Hodgkinson. John has been a member of fotpin since its inception, and before that was part of the team who contributed to weed control on the Pinnacle Nature Reserve and stimulated the formation of fotpin. Despite his other affiliations and interests he is a very active contributor to fotpin, and his name is seen regularly on our "Recent Weeding" web page. Indeed you'll see that he celebrated his award by spending a couple of hours spraying Paterson's curse and Horehound. John is our "go to guy" for information about grasses, and particularly grass weeds and is our main controller of African Lovegrass, Serrated Tussock and Chilean Needle Grass on the Reserve. He has also been an active member of "Friends of Grasslands" for many years, was President of that group last year and is currently vice-President. Being a true quiet achiever, he no doubt makes many other contributions of which we are unaware. Congratulations John on this well-deserved recognition, and thank you for your contributions to fotpin and the broader grassland and woodland conservation community. Thanks very much to everyone who turned out on a beautiful spring-like day on 25th August to assist in the annual count of the kangaroo population on the Pinnacle Nature Reserve and neighbouring paddocks. As usual, we conducted a morning and afternoon count, and as usual the results were quite close. The final result of the count was 650, down only slightly compared to last year's 677, despite the cull of 200 kangaroos in late July. This number (similar in magnitude to those from the previous two year's counts), contrasts starkly with the estimate of 78 made in early 2013 reported by the Animal Justice Party. For more details see this year's count (with photographs) and the count summary for the last three years. Thanks again to Don and Mel from the Environment and Sustainable Development Directorate of the ACT Government for their expert and patient guidance of the count once more. Thanks very much to everyone who turned out on a beautiful spring-like day to assist in the annual count of the kangaroo population on the Pinnacle Nature Reserve and neighbouring paddocks. As usual, we conducted a morning and afternoon count, and as usual the results were quite close. The preliminary results (subject to a final check of the adding up back in the office) are: morning: 687; afternoon: 661, giving an average of 674 and a difference between the two counts of only 3.3%. This is very similar to the average count of 677 obtained in August 2012, despite the fact that 200 kangaroos were culled from the count area in July (emphasising the necessity of an annual cull to control the population). Thanks to Don and Mel from the Environment and Sustainable Development Directorate of the ACT Government for their expert and patient guidance of the count once more. The 3rd fotpin AGM was held on Sunday 14 July at the Weetangera Primary School. 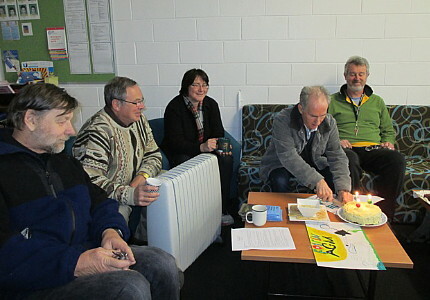 The meeting was attended by 18 people, including special guest speaker Dr Jasmine Foxlee, Volunteer and Parkcare Coordinator for the ACT Parks & Conservation Service. For draft minutes of the meeting and copies of the reports presented to the meeting, see the governance page. The weeding effort summary to the end of May 2013 is now on the web site. With the fall in temperatures and the lack of rain (May was the driest month for many years), both weed growth and weed control have been on the decline this month. However, we go into winter with the knowledge that there will be no major carry-overs of weeds into spring, with the possible exception of Saffron thistles which are difficult to control before winter. Despite the decline, there was still 79 hours of effort recorded. Weed of the month was Horehound at 26 hours; spraying of horehound had been left until the cooler months because it responds better than other weeds at that time. The paddock of the month was North Kama Home paddock with 27 hours, mostly spent on spraying Horehound (15 hours). Finally the activity of the month was spraying (41 hours), as it has been in all but 1 month since the spraying season opened in September. For more exciting statistics, and more importantly what they mean for the progress of our war on weeds, see weeding effort. 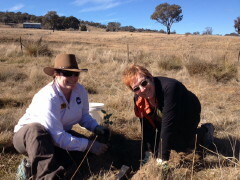 fotpin's final community event for Autumn was a planting day, attended by nearly 30 people who planted just short of 300 tubestock on a beautiful Canberra Autumn morning. 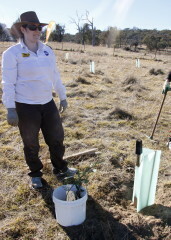 This planting was in an area of the North Kama property chosen to help form a bridge for wildlife between the Pinnacle Nature Reserve and the Kama Nature Reserve (see the location map). 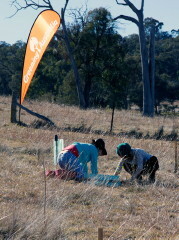 As with our planting in September last year, the event was organised by Greening Australia, who pre-dug all the holes, and provided the plants, tree guards and the necessary tools. They also provided a minibus to ferry people to the planting site, and put on a delicious BBQ lunch at the end of the morning's work. 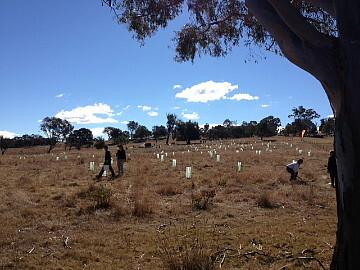 This planting completes the ACT Government's Woodland Restoration activities in the Belconnen Hills woodland corridor. 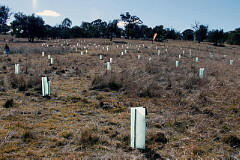 This project was carried out by Greening Australia, under a contract for the ACT Government as part of the Act Government's $1M Woodlands Restoration Plan. Thanks very much to the Greening Australia team, led by Ian Rayner for their excellent organisation and for allowing fotpin to participate with them in this important project. The weeding effort summary to the end of April 2013 is now on the web site. It was a busy weeding month in April, in fact the 171 hours of effort made it the fourth busiest month since records began 34 months ago, and the second month for spraying effort (122 hours). Weed of the month was Paterson's curse at 39 hours, closely followed by Verbascum (36 hours) and Briars (33 hours). The paddock of the month was Bottom Pinnacle with 37 hours, mostly spent on Spear thistles (12 hours) and Paterson's curse and Verbascum (9 hours). Finally the activity of the month was spraying (122 hours), as it has been in all but 1 month since the spraying season opened in September. For more statistics, and more importantly what they mean for the progress of our war on weeds, see weeding effort. The weeding effort summary to the end of March 2013 is now on the web site. Although a quieter weeding month than last year, there was still 120 hours of effort recorded. Weed of the month was the Briar at 32 hours, half of which was Cutting and Daubing large Briars in Bottom Pinnacle, as part of our program to reduce the source of re-infestation of the Reserve. The paddock of the month was Kama with 32 hours, mostly spent on Paterson's curse and Verbascum (10 hours each). Finally the activity of the month was spraying (60 hours), as it has been in all but 1 month since the spraying season opened in September. Fotpin was represented at the Hawker Primary School Autumn Fair on Sunday April 7. 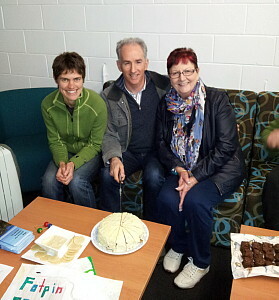 There was a great deal of interest in our stall, as well as in our raffle. 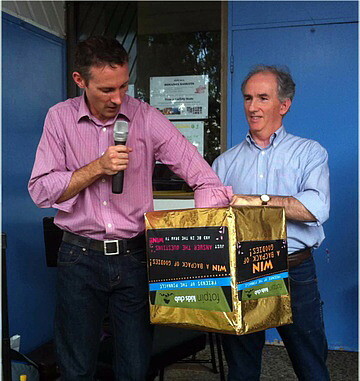 Member for Fraser Andrew Leigh MP draws the raffle, aided by fotpin Convenor John Brannan. Prizes were donated by a committee member and consisted of a backpack of interesting, environmentally focussed books, activities, edibles and "Frogwatch" carry bags loaded with similar items. All in all, a lovely day with smiles all round! 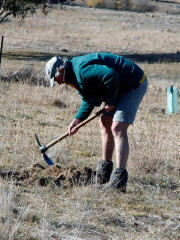 A program of 2 diverse guided walks and a tree and shrub planting have been organised for April and May. The weeding effort summary to the end of January 2013 is now on the web site. January was a quieter month than in previous years, partly because of the hot, dry weather reducing weed growth and making spraying ineffective for some weeds. However, there was still 136 hours of effort, with Lopping and Bagging of Spear thistles and Verbascum in Bottom Pinnacle and North Kama, and spraying of Briars on the Reserve taking much of the time. Some effort also continued on Saffron thistles. Parks is carrying out a kangaroo count on the Kama Nature Reserve, part of the Pinnacle corridor to the Molonglo River (see map for location). They would appreciate help for fotpin members, especially those with experience of the Pinnacle count. If you would like to assist, contact . GCG is holding a Trivia Night to reward and thank volunteers for their hard work throughout the year. With local businesses and community groups involved, as well as Tim the Yowie man as host, GCG's biggest fundraiser of the year promises to be a great night with loads of fantastic prizes up for grabs! If you would like to be part of the fotpin team table, contact . The weeding effort summary to the end of December 2012 is now on the web site. December was a busy month, with spraying of St. John's Wort, Verbascum and Spear Thistles, and slashing of Saffron thistles occupying large amounts of time. There is also a separate summary of our St. John's Wort effort [ 296 kB] this year contrasted with last season.